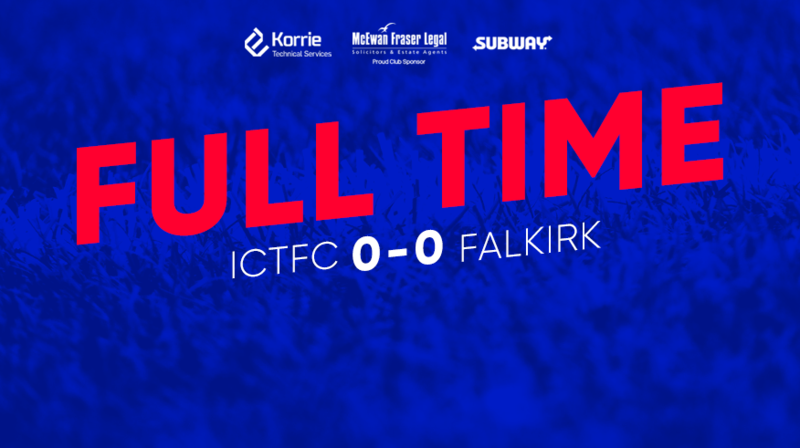 Defences were on top at the Caledonian Stadium as Falkirk came North with a clear game plan; do not concede. It worked as Inverness struggled to break them down with former Partick player Abdul Osman outstanding for Falkirk, and combined with our wayward shooting that ensured the battling Bairns went home with a point. Chances were at a premium in an instantly forgettable first half. The tempo improved in the second but despite some near misses around the Falkirk box it was left to Mark Ridgers to ensure we also took a point as he blocked a late effort from substitute Shayne Lavery from six yards. Some odd results today with County, Dundee United and Dunfermline losing we actually moved further away from the Pars in fifth place. A decent visiting crowd were on hand to see if they could lift the Bairns out of the relegation scrap with a total of over 2800 in attendance on a brisk and blustery afternoon in the Highland Capital. As mentioned above, it was an instantly forgettable first forty-five with the most apt description coming from AJS as he slithered and shivered down the stairs at the interval. Bland! Enough said Sandy. The only plus points for me were that Coll Donaldson was immense at the back for us mopping up every ball forward from Falkirk and Abdul Osman did likewise at the other end to ensure it was a total stalemate. In our defence, the Bairns probably had more to gain from keeping it tight and their tenacity and close shackling of our players made for a dull first half. The pace of the game quickened after the break as Inverness drove towards the North Stand and Charlie Trafford shot wide as more urgency came into our play. Harry Burgoyne saved from man of the moment Aaron Doran as he looked for his fifth goal in as many games, but like his team mates, most efforts were not causing the big keeper too many issues. Harry again denying Doran and a succession of three corners came to nothing. Kevin McHattie had one of our best moments when he flashed a volley just wide from the edge of the box when it looked as though it might find the bottom corner, the ball going agonisingly the wrong side of the post. Brad Mckay met a Chalmers corner from the right but it flashed just wide of the post with defenders relieved to see it miss, the ball rolling out for a corner off Edjenguele's shins . White directed a header well wide on the run under pressure from the two centre backs, the ball just not running for the big man today. Doran came closest of all when he appeared on the left side of the box as he collected a disguised pass from Polworth, but his goalbound shot was cleared away from inside the six yard box by Jordan McGhee. Polly then guided the clearance just wide under pressure from the defender. That could easily have been the opener but for a fortunate block by Edjenguele on Polly, the ball going for a corner. A wonderful jinky run into the box by Trafford almost set up a chance for Tom Walsh but he wanted to take an extra touch to be sure and his right footed effort was subsequently blocked. 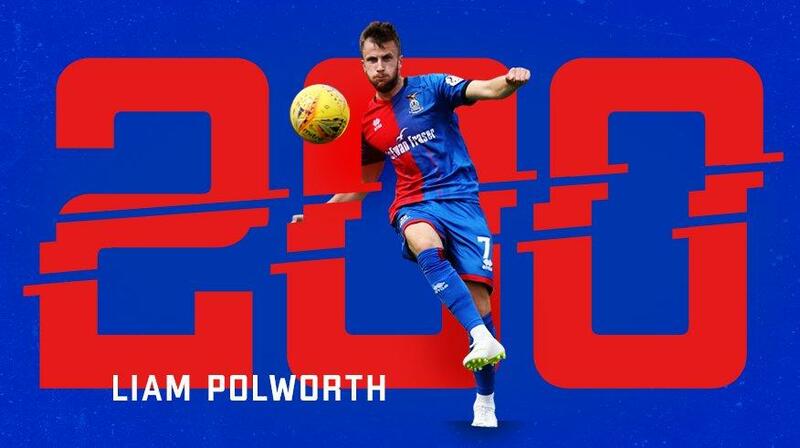 Would have been nice for Polworth to get one on his 200th appearance but he will need to be sharper if he wants to hit the back of the net. Too ponderous around the box for my liking although he was always looking to create something for others, especially in the second half. The customary late flurry brought little reward for Inverness and right at the death Falkirk almost stole it. Substitute Shayne Lavery pounced on the ball plumb in front of Mark Ridgers but the Inverness stopper stood firm as his shot went into his chest to avoid us losing another sore one to the Bairns. It would have been nothing short of robbery had defence minded Falkirk stolen all three points as they did last time they were here. 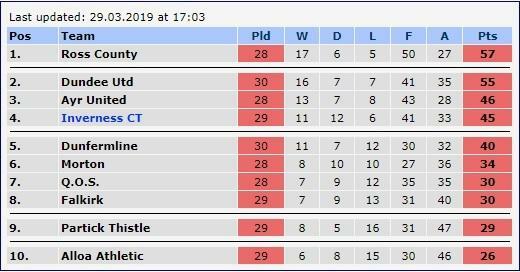 It was miserable enough dropping two points but as it turned out we lost no ground and as for Falkirk, they actually dropped to second bottom after Partick whipped Morton 3-0. 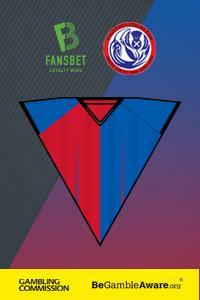 Man of the Match for Inverness was Coll Donaldson. Boy are we going to miss you in the Semi-Final. Abdul Osman was the same for Falkirk proving to be a big obstacle and dominated everything in the air at his end. He's a big unit. Inverness CT manager John Robertson said on BBC Sport: "It was disappointing because we had by far the better chances in the second half. The first half was a total non-event. I don't think people realise how bad the wind was. It was really, really strong blowing straight through the park." Subs (not used): C Mackay, Rooney, McCauley, D Mackay, Machado.